The course is adapted from the 72-hour international Permaculture Design Course syllabus and is accredited by the Permaculture Association (Britain). It covers universal permaculture ethics, principles and design methods. However please note the focus is on non-animal based and stock-free systems & alternatives to animal exploitation. Empowerment is the essence of this Design Course, and practical and theoretical teaching methods are used to create an experience that is fun, lively & inclusive, using group work, discussion, observation, guided walks, ‘hands on’ practical activities, lectures, videos, and slides as learning methods during course sessions. Participants will also work together on applied design activities that will consolidate all of the learning content and empower students to take permaculture back into their own homes, gardens, lives & community, providing essential skills for thriving in the post-peak oil world. The Permaculture Design Course (PDC) is a vital stage in the development of understanding of permaculture ethics, principles, design processes and implementation techniques. We utilise Regenerative Learning principles and methods in order to empower the genius inside all of us to create positive design solutions for your life, your community and your world. To help you decide whether the PDC is for you, it might be a good idea to listen to What is a PDC? to get a sense of ‘What is a Permaculture Design Course? and What isn’t a Permaculture Design Course?’. How does the ‘Vegan’ Permaculture Design Course differ from any other PDC? “The content of the specifically Vegan Permaculture Design Courses isn’t hugely different from other PDCs I’ve taught. The focus is really on design skills – learning to see patterns in nature and in human and social contexts, plus giving us the tools and confidence to take responsibility for our lives and actions, in settings ranging from food production to ecological building to woodland management to ‘green’ economics to urban regeneration. Obviously, however, we would choose venues that are vegan-sympathetic, such as Wild Earth Animal Sanctuary in the USA, or Brook End in Somerset, and would focus on stock-free methods of soil regeneration such as using green manures and tree crops rather than examples or case studies that depend on livestock. Other than this participants can be confident that we are providing a ‘safe zone’, where they will not be criticised for their lifestyle choices, whether vegan or not. Feedback from our first course was that this aspect has been greatly valued, with one person telling us that they had previously had to leave a ‘conventional’ PDC halfway through, due to feeling judged and excluded for their vegan beliefs by fellow participants, and even by the tutor. In addition we have created spaces on the course for discussions around the wider implications of ‘veganic permaculture’. For example, how do we dismantle and replace industrial and animal agriculture with systems that are life-sustaining and liberatory? Another theme that emerged was whether a vegan permaculture (vegaculture?) needs a ‘fourth ethic’ in addition to ‘Earth Care, People Care and Fair Shares’ – one of ‘Do Least Harm’. Is it enough to simply ‘care for’ our non-human fellow earth-citizens whilst our relationships with them continue to be exploitative, or should we actively promote their recognition as self-willed beings with an intrinsic right to exist free from unnecessary harm? Introduce the basic concepts of systems thinking, holistic design and permaculture theory & practice. Introduce tools for making change happen in your own lives and places. Enable learners to integrate ecological & design thinking into their everyday lives. Introduce learners to existing examples of permaculture & relevant networks, and make them familiar with current development in the subject. Graham has been teaching permaculture since 1998, is a holder of the Diploma in Permaculture Design and author of Permaculture A Beginner’s Guide and the Vegan Book of Permaculture. He runs Spiralseed, an ethical venture working in partnership with others who share concerns around social and environmental justice. The "Home-Dome' is a 6m insulated canvas geodesic dome with a full kitchen and fire for community cooking with naturopath Natalie Smyth and eating and relaxing by the fire. It's the eating, reading and sitting room of sorts. The home dome (where the course facilitators stay) is connected to the Yoga Dome next door by a passage. Only the higher income bracket of the course tickets (£850) includes full lunch and supper. Everyone gets some brekkie tho but bring food to share for breakfast! The Yoga dome is connected to the home- dome a clear perspex plastic, 6m geodesic dome raised on stilts with doorways out to the showers, compost loos, washing area and forest garden the . 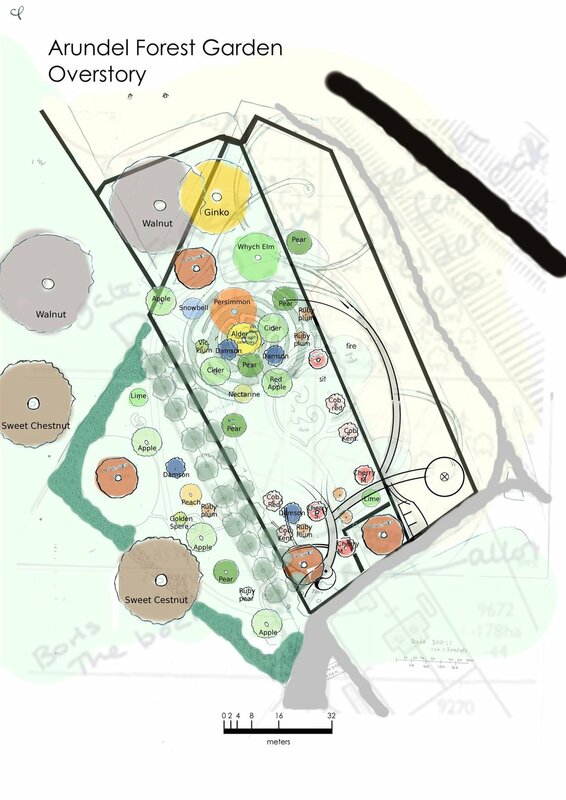 The Grow-Dome is where we do our workshops and this is where the theoretical elements of the course will be taught. There is a cinema screen and projector for movies in the evening. The barn of Her Grace Georgina in near-by Peppering is also available to us if there is extreme weather. The main classroom is however the food forest where we will be undertaking the practical hands on aspect of the course. The Yoga Dome is connected to the Tipi wherein there is a big green carpet and an open fire that burns in a cauldron on a stone plinth. Around the circular tipi, pointing inwards, are laid 10 army lilo beds and atop these are 10 thick woollen, body length tuffets (shaven sheep's wool, from a herd of vegan Shepherds). Attendees will need to bring their own bedding (sleeping bag or two duvets). We have lots of wool rugs and gas heaters but make as if we don't! There is one outdoor, hot-water shower that is a bit temperamental in the wind but is well sheltered (pictured below, in-front of the Yoga Dome). There is also a large outdoor basin with cold water for brushing teeth. There is a long drop, compost loo just 10 meters away from the dome but we encourage people to take a walk into the thickets of the forest garden and bless the young fruit and nut trees! Can’t afford the course fees?